"Honecker" redirects here. For others so named, see Honecker (surname). Not to be confused with Eric Honegger. 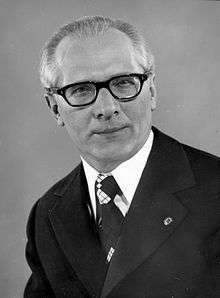 Erich Honecker (German: [ˈeːʁɪç ˈhɔnɛkɐ]; 25 August 1912 – 29 May 1994) was a German politician who, as the General Secretary of the Socialist Unity Party, led the German Democratic Republic from 1971 until the weeks preceding the fall of the Berlin Wall in 1989. From 1976 onward he was also the country's official head of state as chairman of the State Council following Willi Stoph's relinquishment of the post. Honecker's political career began in the 1930s when he became an official of the Communist Party of Germany, a position for which he was imprisoned during the Nazi era. Following World War II, he was freed and soon relaunched his political activities, founding the youth organisation the Free German Youth in 1946 and serving as the group's chairman until 1955. As the Security Secretary of the Party’s Central Committee in the new East German state, he was the prime organiser of the building of the Berlin Wall in 1961 and, in this function, bore responsibility for the "order to fire" along the Inner German border. In 1971, he initiated a political power struggle that led, with Soviet support, to his replacing Walter Ulbricht as First Secretary of the Central Committee and as chairman of the state's National Defense Council. Under his command, the country adopted a programme of "consumer socialism" and moved toward the international community by normalising relations with West Germany and also becoming a full member of the UN, in what is considered one of his greatest political successes. As Cold War tensions eased in the late 1980s under the liberalising reforms of Soviet leader Mikhail Gorbachev, Honecker refused all but cosmetic changes to the East German political system and was consequently forced to resign by his party in October 1989 as the Communist regime sought to retain its power. Honecker's eighteen years at the helm of the soon-to-collapse German Democratic Republic came to an end. Following German reunification, he escaped to the Chilean embassy in Moscow in 1991 but was extradited back to Germany a year later to stand trial for his role in the human rights abuses committed by the East German regime. However, the proceedings were abandoned due to illness and he was freed from custody to travel to join his family in exile in Chile, where he died in May 1994 from liver cancer. Honecker was born in Neunkirchen, in what is now Saarland, as the son of Wilhelm Honecker (1881–1969), a coal miner and political activist, who had married Caroline Catharina Weidenhof (1883–1963) in 1905. The couple had six children together: Katharina (Käthe, 1906–1925), Wilhelm (Willi, 1907–1944), Frieda (1909–1974), Erich, Gertrud (1917–2010) and Karl-Robert (1923–1947). Erich, their fourth child, was born on 25 August 1912 during the period in which the family resided on Max-Braun-Straße, before later moving to Kuchenbergstraße 88 in the present-day Neunkirchen city district of Wiebelskirchen. After World War I, the Territory of the Saar Basin was occupied by France. This change from the strict rule of Baron von Stumm to French military occupation provided the backdrop for what Wilhelm Honecker understood as proletarian exploitation, and introduced young Erich to communism. After his tenth birthday in 1922, Erich Honecker became a member of the Spartacus League's children's group in Wiebelskirchen. Aged 14 he entered the KJVD, the Young Communist League of Germany, for whom he later served the organisation's leader of Saarland from 1931. Honecker did not find an apprenticeship immediately after leaving school, but instead worked for a farmer in Pomerania for almost two years. In 1928 he returned to Wiebelskirchen and began a traineeship as a roofer with his uncle, but quit to attend the International Lenin School in Moscow and Magnitogorsk after the KJVD hand-picked him for a course of study there. There, sharing a room with Anton Ackermann, he studied under the cover name "Fritz Malter". In 1930, aged 18, Honecker entered the KPD, the Communist Party of Germany. His political mentor was Otto Niebergall, who later represented the KPD in the Reichstag. After returning from Moscow in 1931 following his studies at the International Lenin School, he became the leader of the KJVD in the Saar region. After the Nazi seizure of power in 1933, Communist activities were only possible within Germany undercover; the Saar region however still remained outside the German Reich under a League of Nations mandate. Honecker was arrested in Essen, Germany but soon released. Following this he fled to the Netherlands and from there oversaw KJVD's activities in Pfalz, Hesse and Baden-Württemberg. He returned to the Saar in 1934 and worked alongside Johannes Hoffmann on the campaign against the region’s re-incorporation into Germany. A referendum on the area’s future in January 1935 however saw 90.73% vote in favour of reunifying with Germany. Like 4,000 to 8,000 others, Honecker then fled the region, initially relocating to Paris. On 28 August 1935 he illegally travelled to Berlin under the alias "Marten Tjaden", with a printing press in his luggage. From there he worked closely together with the KPD official Herbert Wehner – later to become an SPD member - in opposition/resistance to the Nazi state. On 4 December 1935 Honecker was detained by the Gestapo and until 1937 remanded in Berlin’s Moabit detention centre. On 3 July 1937 he was sentenced to ten years imprisonment for the "preparation of high treason alongside the severe falsification of documents". Honecker spent the majority of his incarceration in the Brandenburg-Görden Prison, where he also carried out tasks as a handyman. In early 1945 he was moved to the Barnimstraße Women’s Prison in Berlin due to good behaviour and, as a trained roofer, in order to be put to work repairing the bomb-damaged building. During an Allied bombing raid on 6 March 1945 he managed to escape and hid himself at the apartment of Lotte Grund, a female prison guard. After several days she persuaded him to hand himself back in and the escape was then covered up by the guard. After the liberation of the prisons by advancing Soviet troops on 27 April 1945, Honecker remained in Berlin. His "escape" from prison and his relationships during his captivity later led to him experiencing difficulties within the Socialist Unity Party, as well as straining his relations with his former inmates. In later interviews and his personal memoirs, Honecker therefore falsified many of the details of his life during this period. Further evidence has also come to light that during his imprisonment Honecker offered the Gestapo information on fellow imprisoned Communists, claimed he had renounced Communism "for good" and even volunteered to serve the war effort as a member of the German army. In May 1945 Honecker was "picked up" by chance in Berlin by Hans Mahle and taken to the Ulbricht Group, a collective of exiled German communists that had returned from the Soviet Union to Germany after the end of the Nazi regime. Through Waldemar Schmidt, Honecker befriended Walter Ulbricht, who had not been aware of him at that point. Honecker’s future role in the group was still undecided until well into the summer months, as he had yet to face a party process. This ended in a reprimand due to his "undisciplined conduct" in fleeing from prison at the start of the year, an action which was debated upon it jeopardising the other (communist) inmates. In 1946 he became the co-founder of the Free German Youth (FDJ), whose chairmanship he also undertook. After the formation of the SED, the Socialist Unity Party, in April 1946 through a merger of the KPD and SPD, Honecker swiftly became a leading party member and took his place in the party's Central Committee. On 7 October 1949 the German Democratic Republic was formed with the adoption of a new constitution, establishing a political system similar to that of the Soviet Union. Within the state’s socialistic single party government, Honecker determinedly resumed his political career and the following year was nominated as a candidate for the Politbüro of the SED’s Central Committee. 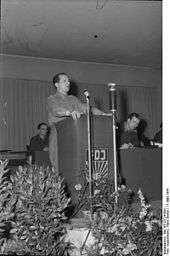 As President of the Free German Youth movement, he organised the inaugural "Deutschlandtreffen der Jugend" in East Berlin in May 1950 and the 3rd World Festival of Youth and Students in 1951, although the latter was beset with organisational problems. During the internal party unrest following the suppressed uprising of June 1953, Honecker sided with First Secretary Walter Ulbricht, despite the majority of the Politburo attempting to dispose Ulbricht in favour of Rudolf Herrnstadt. Honecker himself though faced questioning from party members about his inadequate qualifications for his position. On 27 May 1955 he handed the Presidency of the FDJ over to Karl Namokel, and departed for Moscow to study for two years at the School of the Soviet Communist Party at Ulbricht's request. During this period he witnessed the 20th Congress of the Soviet Communist Party in person, where its First Secretary Nikita Khrushchev denounced Joseph Stalin. After returning to East Germany in 1958 Honecker became a fully-fledged member of the Politburo, taking over responsibility for military and security issues. As the Party Security Secretary he was the prime organiser of the building of the Berlin Wall in August 1961 and also a proponent of the "order to fire" along the Inner German border. While Ulbricht had replaced the state’s planned economy with, firstly the "New Economic System", then the Economic System of Socialism, as he sought to improve the country's failing economy, Honecker declared the main task to in fact be the "unity of economic and social politics", essentially through which living standards (with increased consumer goods) would be raised in exchange for political loyalty. Tensions had already led to his once-mentor Ulbricht removing Honecker from the position of Second Secretary in July 1970, only for the Soviet leadership to swiftly reinstate him. Honecker played up the thawing East-West German relationship as Ulbricht's strategy, in order to win the support of the Soviet leadership under Leonid Brezhnev. With this secured, Honecker was appointed First Secretary (from 1976 titled General Secretary) of the Central Committee on 3 May 1971 after the Soviet leadership forced Ulbricht to step aside "for health reasons". After also succeeding Ulbricht as Chairman of the National Defense Council in 1971, Honecker was eventually also elected Chairman of the State Council on 29 October 1976. With this, Honecker reached the height of power within East Germany. From there on, he, along with Economic Secretary Günter Mittag and Minister of State Security Erich Mielke, made all key government decisions. Until 1989 the "little strategic clique" composed of these three men was unchallenged as the top level of East Germany’s ruling class. Honecker’s closest colleague was Joachim Herrmann, the SED’s Agitation and Propaganda Secretary. Alongside him, Honecker held daily meetings concerning the party’s media representation in which the layout of the party’s own newspaper Neues Deutschland, as well as the sequencing of news items in the national news bulletin Aktuelle Kamera, were determined. Under Honecker's leadership, East Germany adopted a programme of "consumer socialism", which resulted in a marked improvement in living standards already the highest among the Eastern bloc countries. More attention was placed on the availability of consumer goods, and the construction of new housing was accelerated, with Honecker promising to "settle the housing problem as an issue of social relevance". His policies were initially marked by a liberalisation toward culture and art, though this was less about the replacement of Ulbricht by Honecker and more for propaganda purposes. While 1973 brought the World Festival of Youth and Students to East Berlin, soon dissident artists such as Wolf Biermann were expelled and the Ministry for State Security raised its efforts to suppress political resistance. Honecker remained committed to the expansion of the Inner German border and the "order to fire" policy along it. During his time in office around 125 East German citizens were killed while trying to reach the West. Although Honecker remained loyal to the Soviet Union by renouncing the objective of a unified Germany and adopting the "defensive" position of ideological Abgrenzung (demarcation), he signed the Basic Treaty between East and West Germany in 1972 which sought to normalise relations between the nations. 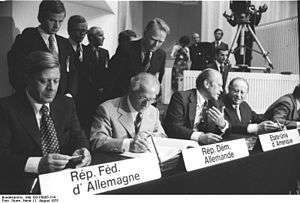 East Germany also participated in the Conference on Security and Co-operation in Europe held in Helsinki in 1975, which attempted to improve relations between the West and the Eastern Bloc, and became a full member of the United Nations. These acts of diplomacy were considered Honecker’s greatest successes in foreign politics. He received additional high-profile personal recognitions including an honorary doctorate by Tokyo’s Nihon University in 1981 and the Olympic Order from the IOC in 1985. In September 1987, he became the first East German head of state to visit West Germany, where he was received with full state honours by West German Chancellor Helmut Kohl in an act that seemed to confirm West Germany's acceptance of East Germany's existence. During this trip he also journeyed to his birthplace in Saarland, where he held an emotional speech in which he spoke of a day when Germans would no longer be separated by borders. This trip had originally been planned in 1983, but was initially blocked by the Soviet leadership which mistrusted the special East-West German relationship. In the late 1980s, Soviet leader Mikhail Gorbachev introduced glasnost and perestroika, reforms to liberalise communism. Frictions between him and Honecker had grown over these policies and numerous additional issues from 1985 onward. East Germany refused to implement similar reforms, with Honecker reportedly telling Gorbachev: "We have done our perestroika; we have nothing to restructure". Gorbachev grew to dislike Honecker, and by 1988 was lumping him in with Bulgaria's Todor Zhivkov, Czechoslovakia's Gustáv Husák and Romania's Nicolae Ceaușescu as a "Gang of Four"—a group of inflexible hardliners unwilling to make necessary reforms. Honecker felt betrayed by Gorbachev in his German policy and ensured that official texts of the Soviet Union, especially those concerning perestroika, could no longer be published or sold in East Germany. At the Warsaw Pact summit on 7–8 July 1989 in Bucharest, the Soviet Union reaffirmed its shift from the Brezhnev Doctrine of the limited sovereignty of its member states, and announced "freedom of choice". The Bucharest statement prescribed that its nations henceforth developed their "own political line, strategy and tactics without external intervention". This called into question the Soviet guarantee of existence for the Communist states in Europe. Already in May 1989 Hungary had begun dismantling its border with Austria, creating the first gap in the so-called Iron Curtain, through which several thousand East Germans quickly fled in hopes of reaching West Germany by way of Austria. Per a 1969 treaty, the Hungarian government should have forced the East Germans back home. However, after a week, the Hungarians relented and let the refugees pass into Austria, telling their outraged East German counterparts that international treaties on refugees took precedence. At the time Honecker was sidelined through illness, leaving his colleagues unable to act decisively. He had been taken ill with biliary colic during the Warsaw Pact summit and flown home to East Berlin. After an initial health stabilisation, he underwent surgery on 18 August 1989 to remove his inflamed gallbladder and, due to a perforation, part of his colon. According to the urologist Peter Althaus, the surgeons left a suspected carcinogenic nodule in Honecker’s right kidney due to his weak condition, and also failed to inform the patient of the suspected cancer; other sources say the tumor was simply undetected. As a result of this operation, Honecker was away from his office until late September 1989. Back in office, Honecker had to contend with the rising number and strength of demonstrations across East Germany that had first been sparked by reports in the West German media of fraudulent results in local elections in May 1989, the same results he had labelled a "convincing reflection" of the populace's faith in his leadership. He also had to deal with a new refugee problem. Several thousand East Germans tried to go to West Germany by way of Czechoslovakia, only to have that government bar them from passing. Several thousand of them headed straight for the West German embassy in Prague and demanded safe passage to West Germany. With some reluctance, Honecker allowed them to go—but forced them to go back through East Germany on sealed trains and stripped them of their East German citizenship. Several members of the SED Politbüro realized this was a serious blunder and made plans to get rid of him. As unrest visibly grew, large numbers began fleeing the country through the West German embassies in Prague and Budapest and over the borders of the "socialist brother" states. Each month saw tens of thousands more exit. On 3 October 1989 East Germany closed its borders to its eastern neighbors and prevented visa-free travel to Czechoslovakia; a day later these measures were also extended to travel to Bulgaria and Romania. East Germany was now not only behind the Iron Curtain to the West, but also cordoned off from most other Eastern bloc states. On 6–7 October 1989 the national celebrations of the 40th anniversary of the East German state took place with Gorbachev in attendance. To the surprise of Honecker and the other SED leaders in attendance, several hundred members of the Free German Youth—reckoned as the future vanguard of the party and nation—began chanting, "Gorby, help us! Gorby, save us!". In a private conversation between the two leaders Honecker praised the success of the nation, but Gorbachev knew that, in reality, it faced bankruptcy; East Germany had already accepted billions of dollars in loans from West Germany during the decade as it sought to stabilise its economy. Attempting to make Honecker accept a need for reforms, Gorbachev warned Honecker that "He who is too late is punished by life", yet Honecker maintained that "we will solve our problems ourselves with socialist means". Protests outside the reception at the Palace of the Republic led to hundreds of arrests. As the reform movement spread throughout Central and Eastern Europe, mass demonstrations against the East German government erupted, most prominently in Leipzig—the first of several demonstrations which took place on Monday night across the country. In response, an elite paratroop unit was dispatched to Leipzig—almost certainly on Honecker's orders, since he was commander-in-chief of the army. A bloodbath was only averted when local party officials themselves ordered the troops to pull back. In the following week, Honecker faced a torrent of criticism. This gave his Politburo comrades the impetus they needed to replace him. 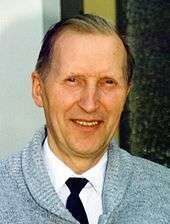 After a crisis meeting of the Politburo on 10–11 October 1989, Honecker's planned state visit to Denmark was cancelled and, despite his resistance, at the insistence of the regime's number-two man, Egon Krenz, a public statement was issued that called for "suggestions for attractive socialism". Over the following days Krenz worked to secure himself the support of the military and the Stasi and arranged a meeting between Gorbachev and Politburo member Harry Tisch, who was in Moscow, to inform the Kremlin about the now-planned removal of Honecker; Gorbachev reportedly wished them good luck. The sitting of the SED Central Committee planned for the end of November 1989 was pulled forward a week, with the most urgent item on the agenda now being the composition of the Politburo. Krenz and Mielke attempted by telephone on the night of 16 October to win other Politburo members over to remove Honecker. At the beginning of the session on 17 October, Honecker asked his routine question of “Are there any suggestions for the agenda?” Stoph replied, "Please, General Secretary, Erich, I propose that a new item be placed on the agenda. It is the release of Erich Honecker as General Secretary and the election of Egon Krenz in his place." Honecker reportedly calmly responded: "Well, then I open the debate". All those present then spoke, in turn, but none in favour of Honecker. Günter Schabowski even extended the dismissal of Honecker to also include his posts in the State Council and as Chairman of the National Defence Council while childhood friend Günter Mittag moved away from Honecker. Mielke supposedly blamed Honecker for almost all the country’s current ills and threatened to publish compromising information that he possessed, if Honecker refused to resign. After three hours the Politburo voted to remove Honecker. In accordance with longstanding practice, Honecker voted for his own removal. Publicly, the decision was announced that "the Central Committee has obliged the request of Erich Honecker to release him from the post of General Secretary, from the Office of State Council Chairman and the post of Chairman of the National Defence Council due to health reasons". Krenz was unanimously elected as his successor as General Secretary. 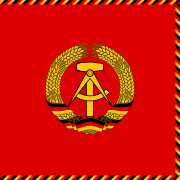 Communist rule in East Germany only survived that of Honecker by two months. Three weeks after Honecker's ousting the Berlin Wall fell, and the SED swiftly lost control of the country. On 1 December, its guaranteed right to rule was deleted from the East German constitution. Two days later Honecker was dropped from the SED’s Central Committee. In a desperate attempt to change its image, the Party of Democratic Socialism, successor to the SED, expelled him later in the year. He went on to join the newly founded Communist Party, remaining a member from 1992 until his death. During November the People's Chamber had already set up a committee to investigate corruption and abuses of office, with Honecker being alleged to have received annual donations from the National Academy of Architecture of around 20,000 marks as an "honorary member". On 5 December 1989 the chief public prosecutor in East Germany formally launched a judicial inquiry against him on charges of high treason, abuses of confidence and embezzlement to the serious disadvantage of socialist property (the charge of high treason was dropped in March 1990). As a result, Honecker was placed under house arrest for a month. Following the lifting of his house arrest, Honecker and his wife Margot were forced to vacate their apartment in the Waldsiedlung housing area in Wandlitz, exclusively used by senior SED party members, after the People’s Chamber decided to put it to use as a sanatorium for the disabled. In any case, Honecker spent the majority of January 1990 in hospital after having the error of the tumour missed in 1989 corrected after the suspicion of cancer was confirmed. Upon leaving hospital on 29 January he was re-arrested and held at the Berlin-Rummelsburg remand centre. However, on the evening of the following day, 30 January, Honecker was again released from custody: The district court had annulled the arrest warrant and, due to medical reports, certified him unfit for detention and interrogation. Lacking a home, Honecker instructed his lawyer Wolfgang Vogel to ask the Evangelical Church in Berlin-Brandenburg for help. Pastor Uwe Holmer, leader of the Hoffnungstal Institute in Lobetal, Bernau bei Berlin, offered the couple a home in his vicarage. This drew immediate condemnation and later demonstrations against the church for assisting the Honeckers, given they had both discriminated against Christians who did not conform with the SED regime’s ideology. Aside from a stay at a holiday home in Lindow in March 1990 that lasted only one day before protests swiftly brought it to an end, the couple resided at the Holmer residence until 3 April 1990. The couple then moved into a three-room living quarters within the Soviet military hospital in Beelitz. Here, doctors diagnosed a malignant liver tumour following another re-examination. Following German reunification, prosecutors in Berlin issued a further arrest warrant for Honecker in November 1990 on charges that he gave the order to fire on escapees at the Inner German border in 1961 and had repeatedly reiterated that command (most specifically in 1974). However, this warrant was not enforceable because Honecker lay under the protection of Soviet authorities in Beelitz. On 13 March 1991 the Honeckers fled Germany from the Soviet-controlled Sperenberg Airfield to Moscow on a military jet with the aid of Soviet hardliners. The German Chancellery had only been informed by Soviet diplomats about the Honeckers’ flight to Moscow one hour in advance. It limited its response to a public protest, claiming the existence of an arrest warrant meant the Soviet Union was breaching international law by admitting Honecker. The initial Soviet reaction was that Honecker was now too ill to travel and was receiving medical treatment after a deterioration of his health. He underwent further surgery the following month. On 11 December 1991 the Honeckers sought refuge in the Chilean Embassy in Moscow, while also applying for political asylum in the Soviet Union. Despite an offer of help from North Korea, Honecker instead hoped for special protection from Chile as, under his rule, East Germany had granted many Chileans exile following the military coup of 1973 by Augusto Pinochet. In addition his daughter Sonja was married to a Chilean. Chilean authorities, however, stated he could not enter their land without a valid German passport. Mikhail Gorbachev agreed to the dissolution of the Soviet Union on 25 December 1991 and ceded all the powers still vested in it to Russian leader Boris Yeltsin. Russian authorities had long been keen on expelling Honecker – against the wishes of Gorbachev – and the new government now demanded that he leave the country or else face deportation. During early 1992 conflicting reports emerged regarding Honecker's medical state and the existence of liver cancer which either increased or decreased the likelihood of extradition accordingly. In June 1992, Chilean President Patricio Aylwin, leader of a left-centrist coalition, finally assured German Chancellor Helmut Kohl that Honecker would be leaving the embassy in Moscow. Reportedly against his will, Honecker was ejected from the embassy on 29 July 1992 and flown to Berlin's Tegel Airport, where he was arrested and detained in Moabit Prison. By contrast, his wife Margot travelled on a direct flight from Moscow to Santiago, Chile, where she initially stayed with her daughter Sonja. Honecker's lawyers unsuccessfully appealed for him to be released from detention in the period leading up to his trial. On 12 May 1992, while under protection in the Chilean embassy in Moscow, Honecker, along with several co-defendants, including Erich Mielke, Willi Stoph, Heinz Kessler, Fritz Streletz and Hans Albrecht, was accused in a 783-page indictment of his part in the "collective manslaughter" of 68 people as they attempted to flee East Germany. It was alleged that Honecker, in his role as Chairman of the National Defence Council, had both given the decisive order in 1961 for the construction of the Berlin Wall and also, at subsequent meetings, ordered the extensive expansion of the border fortifications around West Berlin and the barriers to the West so as to make any passing impossible. In addition, specifically at a May 1974 sitting of the National Defence Council, he had stated that the development of the border must continue, that lines of fire were warranted along the whole border and, as prior, the use of firearms was essential: "Comrades who have successfully used their firearms [are] to be praised". Honecker, in his role of chairman of the party, was responsible for the deaths of many more than the 68 mentioned above. As of 22 April 2015, well over 1,000 deaths have been discovered mainly through secret East German documentation: "It is still not known for sure how many people died on the inner German border or who they were, as the East German state treated such information as a closely guarded secret. But numbers have risen steadily since unification, as evidence has been gathered from East German records. Current unofficial estimates put the figure at up to 1,100 people." And also, from the same article, "In 1974, Erich Honecker, as Chairman of the GDR's National Defence Council, ordered: "Firearms are to be ruthlessly used in the event of attempts to break through the border, and the comrades who have successfully used their firearms are to be commended. "," as quoted in Hans-Hermann Hertle's book from the same citation, p. 100-101. Honecker is surely responsible for the deaths of many of the 1,100 during his long reign, as can be evidenced from his order that "firearms are to be ruthlessly used" to prevent border crossers. The charges were approved by the Berlin District Court on 19 October 1992 at the opening of the trial. On the same day, it was decided that the hearing of 56 charges would be postponed and the remaining twelve cases would be the subject of the trial to begin on 12 November 1992. The question of under which laws the former East German leader could be tried was highly controversial and, in the view of many jurists, the process had an uncertain outcome. During his 70-minute-long statement to the court on 3 December 1992, Honecker admitted political responsibility for the building of the Berlin Wall and subsequent deaths at the borders, but claimed he was "without juridical, legal or moral guilt". He blamed the escalation of the Cold War for the building of the Berlin Wall, saying the decision had not been taken solely by the East German leadership but all the Warsaw Pact nations that had collectively concluded in 1961 that a "Third World War with millions dead" would be unavoidable without this action. 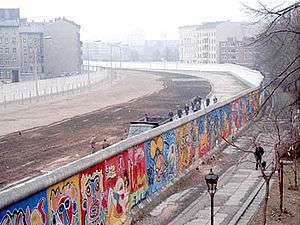 He quoted several West German politicians who had opined that the wall had indeed reduced and stabilised the two factions. He stated that he had always regretted every death, both from a human point of view and due to the political damage they caused. Honecker said the Berlin Wall was “unavoidable” to prevent a "third World War with millions dead"
Making reference to past trials in Germany against communists and socialists such as Karl Marx and August Bebel, he claimed that the legal process against him was politically motivated and a "show trial" against communism. He stated that no court lying in the territory of West Germany had the legal right to place him, his co-defendants or any East German citizen on trial, and that the portrayal of East Germany as an "Unrechtsstaat" was contradictory to its recognition by over one hundred other nations and the UN Security Council. Furthermore, he questioned how a German court could now legally judge his political decisions in the light of the lack of legal action taken over various military operations that had been carried out by Western nations with either overt support or absence of condemnation from (West) Germany. He dismissed public criticism of the Stasi, arguing that journalists in Western countries were praised for denouncing others. While accepting that the "experiment" of East Germany had failed, he claimed that it had nonetheless proved "that socialism can be possible and be better than capitalism". By the time of the proceedings Honecker was already seriously ill. A new CT scan in August 1992 had confirmed an ultrasound examination made in Moscow and the existence of a malignant tumour in the right lobe of his liver. Based on these findings and additional medical testimonies, Honecker’s lawyers requested that the legal proceedings, as far as they were aimed against their client, be abandoned and the arrest warrant against him withdrawn; the cases against both Mielke and Stoph had already been postponed due to their ill health. Arguing that his life expectancy was estimated to be three to six months, while the legal process was forecast to take at least two years, his lawyers questioned whether it was humane to try a dying man. Their application was rejected on 21 December 1992 when the court concluded that, given the seriousness of the charges, no obstacle to the proceedings existed. Honecker lodged a constitutional complaint to the recently created Berlin Constitutional Court, stating that the decision to proceed violated his fundamental right to human dignity, which was an overriding principle in the Constitution of Berlin, above even the state penal system and criminal justice. On 12 January 1993 Honecker’s complaint was upheld and the Berlin District Court therefore abandoned the case and withdrew their arrest warrant. An application for a new arrest warrant was rejected on 13 January. The court also refused to commence with the trial related to the indictment of 12 November 1992, and withdrew the second arrest warrant related to these charges. After a total of 169 days Honecker was released from custody, drawing protests both from victims of the East German regime as well as German political figures. 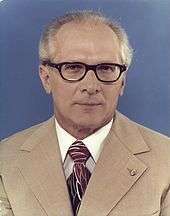 Honecker flew via Brazil to Santiago, Chile to reunite with his wife and daughter Sonja, who lived there with her son Roberto. Upon his arrival he was greeted by the leaders of the Chilean Communist and Socialist parties. In contrast, his co-defendants Heinz Kessler, Fritz Streletz and Hans Albrecht were sentenced on 16 September 1993 to imprisonment of between four and seven-and-a-half years. 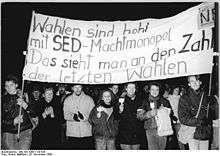 On 13 April 1993 a final attempt to separate and continue the trial against Honecker in his absence was discontinued. Four days later, on the 66th birthday of his wife Margot, he gave a final public speech, ending with the words: "Socialism is the opposite of what we have now in Germany. For that I would like to say that our beautiful memories of the German Democratic Republic are testimony of a new and just society. And we want to always remain loyal to these things". On 29 May 1994 he died aged 81 in a terraced house in the La Reina district of Santiago. His funeral, arranged by the Communist Party of Chile, was conducted the following day at central cemetery in Santiago. Honecker was married three times. After being liberated from prison in 1945 he married the prison warden Charlotte Schanuel (née Drost), nine years his senior, on 23 December 1946. She died suddenly from a brain tumour in June 1947. Details of this marriage were not revealed until 2003, well after his death. By the time of her death, Honecker was already romantically involved with the Free German Youth official Edith Baumann , whom he met on a trip to Moscow. With her he had a daughter, Erike (b. 1950), who later gave him his granddaughter Anke. The couple married in 1949, but in 1952 he fathered an illegitimate daughter, Sonja (b. December 1952), with Margot Feist, a People's Chamber member and chairperson of the Ernst Thälmann Pioneer Organisation. Baumann refused to grant Honecker a divorce until January 1955, even writing directly to Walter Ulbricht to inform him of Honecker's extramarital activity in the hope of him pressuring Honecker to end his relationship with Feist. Following his divorce and reportedly under pressure from the Politburo, he married Feist. The exact date of the wedding ceremony is unknown. 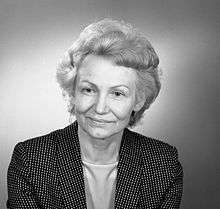 For more than twenty years, Margot Honecker served as the East German Minister for People's Education. In 2012 intelligence reports collated by West German spies alleged that both Erich and his wife had secret affairs but did not divorce for political reasons. Honecker became a grandfather in 1979, when his daughter Sonja, who had married the Chilean Leonardo Yáñez Betancourt, had a son, Roberto Yanez Betancourt y Honecker. Roberto's origins are debated; he is claimed to be the illegally adopted son of Mrs. Heidi Stein, Dirk Schiller, born on 13 June 1975 in Görlitz, who was stolen at only 3 years old by Stasi agents. Honecker's daughter (who divorced Leonardo in 1993) and grandson are still alive in Santiago, following the death of Margot Honecker. Another grandchild was Erike's daughter, Anke (her date of birth is unknown). A previously unknown grandchild, Mariana, allegedly died in 1988 at the age of two years and Honecker himself was heartbroken. Like his predecessor Walter Ulbricht, Honecker ruled with neither charisma nor oratory power. His speeches at party conferences and at diplomatic events showed his awkward and wooden style of delivery, which was parodied by satirists outside East Germany. In his time as General Secretary his stance was described as an “almost sinister, unstudied immovability”. The 1983 Udo Lindenberg song “Sonderzug nach Pankow” ironically aimed at the then-State Council and their lack of looseness also achieved great popularity in East Germany. In 1987 Honecker sent Lindenberg a shawm—an instrument he had played in his youth as a member of the Roter Frontkämpferbund—in response to the gift of a leather jacket from him. Dmitri Vrubel's 1990 mural on the Berlin Wall "My God, Help Me to Survive This Deadly Love", depicting a “socialist fraternal kiss” between Honecker and Leonid Brezhnev, became known around the world. 1 2 3 Wilsford, David (1995). Political Leaders of Contemporary Western Europe. Greenwood Publishing Group. p. 195. ↑ Epstein, Catherine (2003). The Last Revolutionaries: German Communists and their century. Harvard University Press. p. 40. 1 2 3 4 "Erich Honecker (1912-1994), DDR-Staatsratsvorsitzender" (in German). www.rheinische-geschichte.de. ↑ Epstein, Catherine (2003). The Last Revolutionaries: German Communists and their century. Harvard University Press. p. 239. ↑ Morina, Christina (2011). Legacies of Stalingrad: Remembering the Eastern Front in Germany since 1945. Cambridge University Press. p. 178. ↑ "Honecker's Geheimakte lagerte in Mielke's Tresor" (in German). Die Welt. 25 August 2012. 1 2 3 "Immer bereit". Der Spiegel (in German). 3 October 1966. p. 32. 1 2 "Zum 100. Geburtstag Erich Honeckers" (in German). Unsere Zeit: Zeitung der DKP. 24 August 2012. 1 2 3 "Honeckers geheime Ehen" (in German). Netzeitung.de. 20 January 2003. 1 2 "Farblos, scheu, wenig kameradschaftlich". Der Spiegel (in German). Hamburg. 31 October 1977. p. 87. ↑ Przybylski, Peter (1991). Tatort Politbüro: Die Akte Honecker (in German). Rowohlt. pp. 55–65. ↑ Völklein, Ulrich (2003). Honecker: Eine Biografie (in German). pp. 154–178. ↑ Paterson, Tony (6 June 2011). "Honecker was forced to resign by secret police". The Independent. 1 2 3 Epstein, Catherine (2003). The Last Revolutionaries: German Communists and their century. Harvard University Press. p. 112. ↑ Epstein, Catherine (2003). The Last Revolutionaries: German communists and their century. Harvard University Press. pp. 136–137. ↑ Dankiewicz, Jim (1999). The East German Uprising of June 17, 1953 and its Effects on the USSR and the Other Nations of Eastern Europe. University of California, Santa Barbara. 1 2 3 4 Winkler, Heinrich August (2007). Germany: The Long Road West, Vol. 2: 1933-1990. Oxford University Press. pp. 266–268. 1 2 3 4 5 "Der unterschätzte Diktator". Der Spiegel (in German). Hamburg. 20 August 2012. p. 46. ↑ "Erich Honecker on the "Unity of Economic and Social Policy" (June 15-19, 1971)". German History in Documents and Images (GHDI). ↑ Allison, Mark (2012). More from Less: Ideological Gambling with the Unity of Economic and Social Policy in Honecker's GDR (PDF). Central European History Journal (45). pp. 102–127. ↑ Klenke, Olaf (2004). Betriebliche Konflikte in der DDR 1970/71 und der Machtwechsel von Ulbricht auf Honecker (in German). ↑ Staar, Richard F. (1984). Communist Regimes in Eastern Europe. Hoover Press. p. 105. ↑ Wehler, Hans-Ulrich (2008). Deutsche Gesellschaftsgeschichte, Bd. 5: Bundesrepublik und DDR 1949–1950 (in German). p. 218. ↑ Honecker, Erich. 1984. The GDR: A State of Peace and Socialism http://www.calvin.edu/academic/cas/gpa/erich1.htm. 1 2 "Protokoll der 45. Sitzung des Nationalen Verteidigungsrates der DDR (3 May 1974)" (in German). chronik-der-mauer.de. ↑ "Todesopfer an der Berliner Mauer". chronik-der-mauer.de. ↑ "Helsinki Final Act signed by 35 participating States". Organization for Security and Co-operation in Europe. ↑ "Honecker begins historic visit to Bonn today". Los Angeles Times. 7 September 1987. ↑ Gedmin, Jeffrey (2003). The Hidden Hand: Gorbachev and the Collapse of East Germany. Harvard University Press. pp. 55–67. ↑ Treisman, Daniel (2012). The Return: Russia's Journey from Gorbachev to Medvedev. Free Press. p. 83. ISBN 1416560726. ↑ "Not all of East Europe is ready for reform". Chicago Tribune. 25 July 1989. 1 2 3 4 5 6 7 8 9 Sebetsyen, Victor (2009). Revolution 1989: The Fall of the Soviet Empire. New York City: Pantheon Books. ISBN 0-375-42532-2. ↑ "Two Germanys' political divide is being blurred by Glasnost". New York Times. 18 December 1988. ↑ Brown, Archie (2009). The Rise and Fall of Communism. Ecco. ↑ "Warsaw Pact warms to Nato plan". Chicago Tribune. 9 July 1989. 1 2 "July 1989". chronik-der-mauer.de. ↑ "East German exodus echoes 1961". Chicago Tribune. 22 August 1989. ↑ "Honecker recuperating after gallstone operation". Associated Press. 24 August 1989. ↑ "Upheaval in the East; Honecker, in disgrace and in poor health, is arrested as he leaves a Berlin hospital". New York Times. 30 January 1990. ↑ Kunze, Thomas (2001). Staatschef: Die letzten Jahre des Erich Honecker (in German). Links. p. 77. ↑ "Honecker deteriorating". Deseret News. 11 September 1989. ↑ "Honecker returns to work after surgery". Los Angeles Times. 26 September 1989. ↑ "The Opposition charges the SED with fraud in the local elections of May 1989 (May 25, 1989)". German History in Documents and Images. ↑ De Nevers, Rene (2002). Comrades No More: The Seeds of Political Change in Eastern Europe. MIT Press. p. 173. ↑ "Hundreds of East Germans reported in Prague Embassy". Associated Press. 21 September 1989. ↑ "Refugees crowd West German embassies in East Bloc". Associated Press. 19 September 1989. ↑ "16,000 refugees flee for freedom East Germany exodus grows". Los Angeles Times. 12 September 1989. ↑ "East Germans fill refugee camps; New wave from Czechoslovakia". Associated Press. 12 September 1989. ↑ "East Germany closes its border after 10,000 more flee to West". Chicago Tribune. 4 October 1989. ↑ "It's not easy being East Germany". Chicago Tribune. 7 October 1989. ↑ "Gorbachev in East Berlin". BBC News. 25 March 2009. 1 2 3 "Oct. 7, 1989: How 'Gorbi' spoiled East Germany's 40th Birthday Party". Der Spiegel. 25 March 2009. ↑ "Gorbachev visit triggered Honecker's ouster, former aid says". Associated Press. 27 December 1989. ↑ "East Germany seeking $371 million Bonn loan". New York Times. 2 December 1983. ↑ "Leadership reaffirms commitment to Communism". Associated Press. 11 October 1989. ↑ "Plot to oust East German leader was fraught with risks". Chicago Tribune. 28 October 1990. ↑ "Erich Honeckers Sturz" (in German). MDR. 5 January 2010. 1 2 "Die Genossen opfern Honecker – zu spät" (in German). Tagesspiegel. 17 October 2009. 1 2 3 "Sekt statt Blut" (in German). Der Spiegel. 30 August 1999. p. 60. ↑ "Honecker was forced to resign by secret police". The Independent. 6 June 2011. ↑ "1989: East Germany leader ousted". BBC. ↑ "Honecker ousted in East Germany, ending 18 years of Iron Rule". Los Angeles Times. 18 October 1989. ↑ "East Germans oust Honecker". The Guardian. 19 October 1989. ↑ "Entire East German leadership resigns". Los Angeles Times. 4 December 1989. ↑ "East Germany to prosecute ousted rulers". Chicago Tribune. 27 November 1989. ↑ "Upheaval in the East; Tide of luxuries sweep German leaders away". New York Times. 10 December 1989. ↑ "Bürger A 000 000 1". Der Spiegel (in German). 26 February 1990. p. 22. ↑ "East Germany calls off plans to try Honecker, 3 others". Los Angeles Times. 26 March 1990. 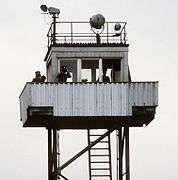 1 2 "Honecker released from month-long house arrest". Los Angeles Times. 5 January 1990. ↑ "Honecker has tumor removed". Los Angeles Times. 10 January 1990. ↑ "Honecker jailed on treason charge". Los Angeles Times. 29 January 1990. ↑ "Honecker freed; Court says he's too ill for jail". Los Angeles Times. 31 January 1990. 1 2 3 "Margot und Erich Honecker Asyl im Pfarrhaus gewährt" (in German). Mainpost.de. 4 April 2011. ↑ "Der Mann, der Erich Honecker damals Asyl gab" (in German). Hamburger Abendblatt. 30 January 2010. ↑ "Ein Sieg Gottes" (in German). Berliner Zeitung. 30 January 2010. ↑ Kunze, Thomas (2001). Staatschef: Die letzten Jahre des Erich Honecker (in German). Links. pp. 106–107. ↑ "Honecker accused of ordering deaths". Los Angeles Times. 2 December 1990. ↑ "Honecker's Arrest Sought in Berlin Wall Shootings". New York Times. 2 December 1990. ↑ "Soviets may return Honecker to West". Los Angeles Times. 26 August 1991. 1 2 "Honecker flown to Moscow by Soviets; Bonn protests". Los Angeles Times. 15 March 1991. ↑ "Germany demands return of Honecker". Los Angeles Times. 16 March 1991. ↑ "Moscow military hospital operates on Honecker". Orlando Sentinel. 16 April 1991. ↑ "Chilean Embassy in Moscow is giving shelter to Honecker". Los Angeles Times. 13 December 1991. ↑ "Moscow's Communist faithful hold rally for Honecker". Los Angeles Times. 17 December 1991. ↑ "Chile shelters Honecker because of past favors". Seattle Times. 12 March 1992. ↑ "Ein Leben im Rückwärts" (in German). Frankfurter Allgemeine Zeitung. 18 February 2012. ↑ "Chile in quandary over protecting Honecker". New York Times. 15 January 1990. ↑ "Russia says Honecker will be expelled". Los Angeles Times. 17 November 1991. ↑ "Russia wants to expel former East German leader". Orlando Sentinel. 17 November 1991. ↑ "Soviet disarray; Pyongyang offers Honecker refuge". New York Times. 15 December 1991. ↑ "Honecker is reported at clinic for checkup". New York Times. 27 February 1992. ↑ "Chile weighs evidence Honecker faked illness". Los Angeles Times. 7 March 1992. ↑ "Honecker to leave embassy sanctuary in Chile". Seattle Times. 30 June 1992. ↑ "Honecker arraigned on 49 counts". Deseret News. 30 June 1992. ↑ "Honecker back in Berlin, may go on trial". Los Angeles Times. 30 July 1992. ↑ "Ousted East German leader returned to stand trial". Baltimore Sun. 30 July 1992. ↑ "Court in Berlin refuses to free ailing Honecker". Los Angeles Times. 4 September 1992. ↑ "Honecker charged in deaths of East Germans in flight". New York Times. 16 May 1992. 1 2 3 4 5 6 "The Honecker trial: The East German past and the German future" (PDF). Helen Kellogg Institute for International Studies. January 1996. ↑ "More Than 1,100 Berlin Wall Victims". Deutsche Welle. 9 August 2005. Retrieved 8 August 2009. 1 2 "Honecker trial starts Nov. 12". New York Times. 21 October 1992. 1 2 3 4 5 6 Laughland, John (2008). A History of Political Trials: From Charles I to Saddam Hussein. Peter Lang. pp. 195–206. ↑ Weitz, Eric D. (1996). Creating German Communism, 1890-1990: From Popular Protests to Socialist State. Princeton University Press. p. 3. 1 2 "Das Ende der Honecker-Ära" (in German). MDR. 5 January 2010. 1 2 3 "Persönliche Erklärung von Erich Honecker vor dem Berliner Landgericht am 3. Dezember 1992" (in German). Glasnost.de. ↑ "Terminally ill Honecker should be released from jail, court rules". Washington Post. 13 January 1993. 1 2 "Illness threatens Honecker's trial". New York Times. 18 November 1992. ↑ "Doctor says Honecker too sick to stand trial". Chicago Tribune. 17 August 1992. ↑ "Report sent to court gives Honecker short time to live". New York Times. 16 December 1992. ↑ "Honecker trial to go forward". New York Times. 22 December 1992. ↑ Quint, Peter E. (1997). The Imperfect Union: Constitutional Structures of German Unification. Princeton University Press. pp. 96–97. ↑ "Court ends Honecker trial, citing violation of 'human dignity'". Baltimore Sun. 13 January 1993. ↑ "Honecker release drawing fire in Germany". New York Times. 24 January 1993. ↑ "Frail Honecker arrives in Santiago". Los Angeles Times. 15 January 1993. ↑ "Mielke und Honecker: Konspirationsgewohnt" (in German). Frankfurter Allgemeine Zeitung. ↑ "Wo Honecker heimlich begraben wurde" (in German). Bild. 25 August 2012. 1 2 "Honeckers verschwiegene Ehe". Der Spiegel (in German). 20 January 2003. p. 20. 1 2 "Honeckers Frauen". MDR (in German). 10 February 2011. ↑ Rodden, John (2002). Repainting the Little Red Schoolhouse: A History of Eastern German Education, 1945-1995. Oxford University Press. p. 418. ↑ Kunze, Thomas (2001). Staatschef: Die letzten Jahre des Erich Honecker (in German). Links. pp. 98–99. ↑ "Zwei Saarländer an der Spitze". Die Zeit (in German). 23 August 2012. Fulbrook, Mary. (2008) The people's state: East German society from Hitler to Honecker. Yale University Press. Wilsford, David, ed. Political leaders of contemporary Western Europe: a biographical dictionary (Greenwood, 1995) pp. 195-201. Honecker, Erich. (1981) From My Life. New York: Pergamon, 1981. ISBN 0-08-024532-3. Wikimedia Commons has media related to Erich Honecker.